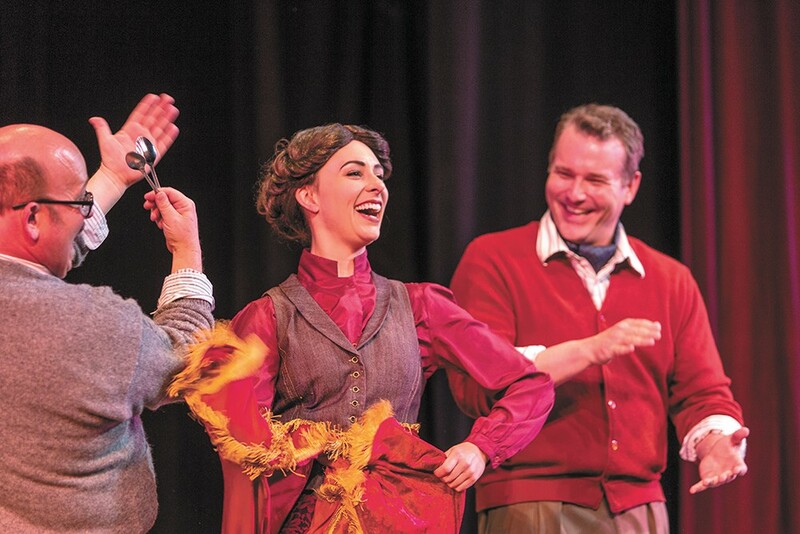 Allison Standley (center) and Greg Stone (right) in Coeur d’Alene Summer Theatre’s production of My Fair Lady. Call it Coeur d'Alene Summer Theatre, version 2.0. The 47th year of this nonprofit organization's season of plays is going to feel a little different than the 46th installment. First off, there's a new venue. Then there's a new front office and philosophy. Regardless, professional theater, just as it has every summer since 1968, will hit the stage in North Idaho. "We have a lot at stake here. We're letting people know that we're still open," says Laura Little, who was hired as the summer theater's executive director in October after the organization's board laid off its executive staff. A seasoned theater producer who still works on Broadway productions when not consumed with the summer theater, this is Little's second time around on the staff of the organization. 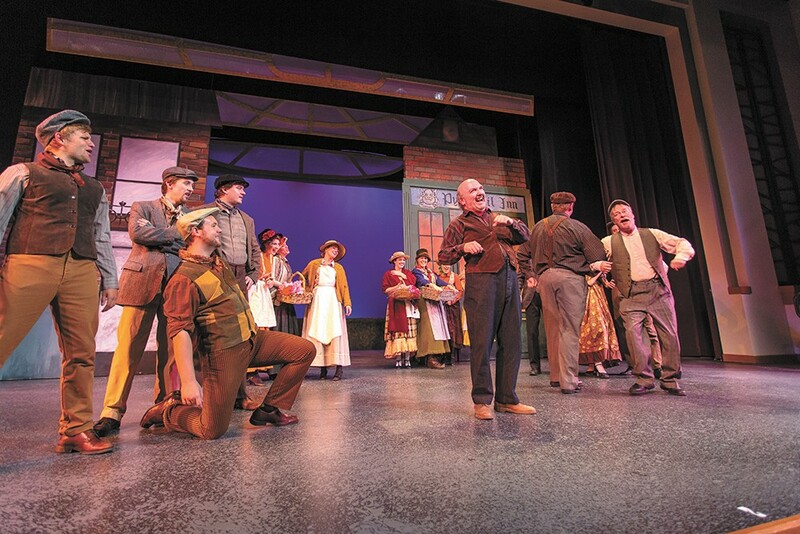 "People are going to see the quality of these productions and remember why they love this," she says, just a few days prior to the opening night of My Fair Lady, the first show of a pared-down season. There's a reason some people might need a reminder that Coeur d'Alene Summer Theatre is alive and well. During the final weeks of last summer's season, the group told theatergoers that due to sluggish ticket sales, they needed to raise $150,000 in order to keep the theater continuing into 2014. The organization, its former organizers told us last year, had become overly dependent on ticket sales (regardless of netting some $700,000 in sales in 2012) as opposed to fundraising and other revenue sources, and that caught up with them. After some promising initial fundraising, the summer theater's board voted to disband the organization completely. My Fair Lady opens this week at the Kroc Center. That's when they brought in Little, who oversaw a streamlining of the organization, which included moving from the 1,100-seat theater at North Idaho College (where ushers alone cost the organization $16,000 per season) to the Kroc Center's 400-seat venue. It also meant going from four full productions to just two (in addition to a pair of one-night engagements) and hiring a new artistic director to replace Roger Welch, a Coeur d'Alene Summer Theatre veteran for more than a quarter-century. These days, Little is "watching every penny" to make for a more efficient organization that she hopes will be back on firm financial ground this summer. Part of that means having out-of-town actors stay at her home. Another familiar face returning this year is Jadd Davis, who cut his acting teeth in a Coeur d'Alene Summer Theater production of Into the Woods in 2002. A Post Falls native and a graduate of Eastern Washington University, Davis returned to the theater during his college years and has kept coming back, including work as an assistant director on summer theater productions. "This is my theater," says Davis. "I've turned down higher-paying roles to come work here in the past, just because I'd get to be here." Davis was performing in a production of Les Misérables last summer when he got the call about taking the artistic director job in Coeur d'Alene. Just weeks before he got that call, he had come out to Coeur d'Alene to help with a fundraiser aimed at keeping the organization afloat. This May, the 32-year-old, his wife and their son were heading back to Davis' old theater for a new job that this week found him in daylong rehearsals of My Fair Lady, which he's directing with a cast of local and nonlocal professional actors, the same mix of talent the theater has used for decades. "It's important to me to cast the best people possible. The good news is that there are plenty of the good people here," says Davis. "The [actors] from New York or Seattle or wherever are always saying, 'Wow, there's a lot of talent here." One of the talents Davis and Little rave about is Greg Stone, who takes on the role of Henry Higgins (the part played by Rex Harrison in the 1964 movie). The Seattle-raised actor found success in Broadway productions of Les Misérables and Miss Saigon, and recently has lit up the stages in Seattle. He's the sort of actor Davis says can make Coeur d'Alene Summer Theatre a regional attraction. "This is a place where people go to work in the summer. It's a well-known summer stock theater for the area," says Davis. The organization's rebuilding year is mostly playing it safe; thus the selection of My Fair Lady, a tried-and-true classic last performed by Coeur d'Alene Summer Theatre in 2000. But the second show of the season is the more adventurous Addams Family, a pop-rock musical that first hit Broadway in 2010 and toured nationally shortly thereafter. "The American theater runs the risk of becoming overly safe over the fear of losing audience members," says Davis. "As far as being a regional theater, it's really important to honor the heritage of the community, which is why we're doing My Fair Lady, but it's also our goal to do something new like The Addams Family." With the shows beginning this week, Little is hopeful for the future of the Coeur d'Alene Summer Theatre, both artistically and financially. So far, the organization's future looks promising, with Little announcing this week that next year's schedule would feature three full-run shows. She knows things are going to look a little different, and a little smaller. But there's a lot that hasn't changed, she insists.